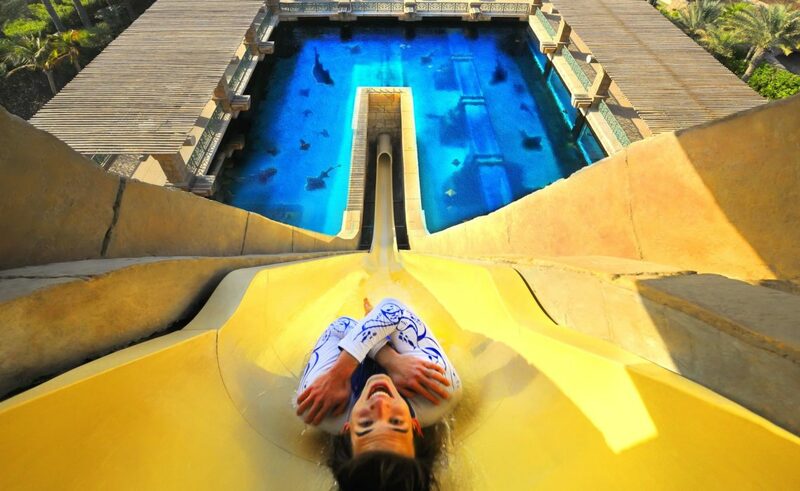 Thrill-seekers will no longer have to rush around the region’s number one waterpark to enjoy it all in one day, with two-day full park experience tickets available from just AED 290 for tourists. With some 20 thrilling waterslides, including the nerve-wracking Leap Of Faith, Shark Attack and Poseidon’s Revenge, there is a lot to enjoy at Aquaventure. The two-day ticket will unlock them all while also giving access to a shark feeding show, unlimited rides on the new Surf’s Up wave rider as well access to the awe-inspiring Lost Chambers Aquarium, home to more than 65,000 marine animals. With so many incredible attractions to see and do, there is no longer any need to cram your to-do list into a matter of hours. What’s more, the two-day ticket does not have to be used in consecutive days and can be redeemed over the space of three days instead. Since opening in 2008, Aquaventure has firmly established itself as the ultimate waterpark destination and is the only one in the Middle East with its own beach area too, with 700 metres of pristine seaside sands. The 17-hectare haven of thrills and spills is home to a range of thrilling slides, as well as a 2.3-kilometre river ride with tidal waves and pools, water rapids and white-water chargers. For the little ones, Splashers is an area designed especially for youngsters, with seven fun-filled waterslides and climbing frames too. While adrenaline seekers will love one of the park’s most fearsome rides, The Leap Of Faith, with an almost vertical drop of nine storeys in three seconds at speeds of up to 60 kilometres per hour. When having the time of their lives works up an appetite, there are a range of great food options to choose from, with 16 different restaurants and kiosks. These include the brilliant Barracudas and the super Shark Bites, with all sorts of tasty treats such as shawarma, burgers, fries, Thai food and dosas on offer.